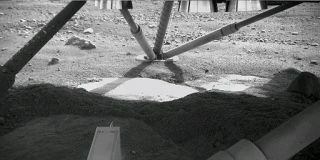 This image, released on May 31, 2008, shows the ground underneath NASA's Phoenix Mars Lander, adding to evidence that descent thrusters dispersed overlying soil and exposed a harder substrate that may be ice. NASA?s Phoenix Mars Lander may have already caught its first glimpse of Martianice less than a week after arriving at its new red planet home. New images released Saturday reveal what could be a patch of exposedice beneath the Phoenix lander, mission managers said in an announcement today.Phoenix beamed the images back to Earth late Friday from its Vastitas Borealislanding site in the northern polar region of Mars after using a roboticarm-mounted camera to peer beneath its undercarriage. The new views revealed patches of smooth, level surfaces beneath Phoenix?sthrusters, boosting the confidence of researchers who had hoped the spacecraft?spulse rocket engines could kick up the Martian topsoil to expose a buriedlayer of water ice. "This suggests we have an ice table under a thin layerof loose soil," said Horst Uwe Keller, the lead scientist for Phoenix?s roboticarm camera at the Max Planck Institute for Solar System Research inKatlenburg-Lindau, Germany. Phoenix, a stationary lander, setdown in the Martian arctic on May 25 to begin a planned three-month missionto probe its surroundings for buried water ice using a scoop-mounted robotic arm,as well as onboard ovens and wet chemistry lab. The probe?s $422 millionmission is aimed at determining whether the icy Martian north could have oncebeen habitable for primitive life. "We were expecting to find ice within two to six inches of thesurface," said Phoenix principal investigator Peter Smith of theUniversity of Arizona in a statement. "The thrusters have excavated two tosix inches and, sure enough, we see something that looks like ice. It's notimpossible that it's something else, but our leading interpretation is ice." Phoenix pulsed its rocket engines to make a three-point landing on abroad, flat valley in a region similar in latitude northwestern Canada onEarth. The area is in a region where spacecraft orbiting Mars have spottedindications of subsurface water ice in the past, making it a prime digging sitefor Phoenix?s robotic arm. NASA?s Phoenix spacecraft is one of three now currently operating on thesurface of Mars. The lander joined two twin robots, the Spirit and Opportunity rovers, whichlanded in 2004 and continue to explore different areas of the planet?s equatorialregions.